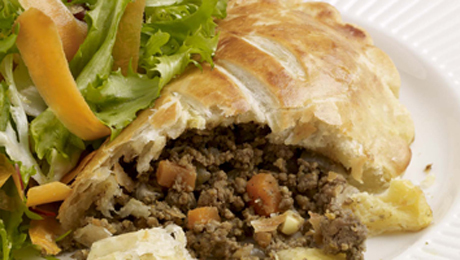 The beauty of this recipe is that the pies can be made up in advance and used as required. With this recipe you could make mini pastries as well by cutting the discs into much smaller pieces. Very easy to prepare. Bought some ingredients in SuperValu but had most at home. The pastry was so easy to make and has given me a new found interest in pastry pies with different fillings. Cooling pastry in the fridge now while I pop out to collect son from school. All going according to plan. Allow the meat mixture to cool down completely and then mixing in the natural yogurt. All done and cooking away. I cut the pastry with my Costa cafe cup and the smaller ones with pastry cutter shapes but I have to say, I had great fun. Served with salad and chips. I melted cheese on the chips. Yummy.